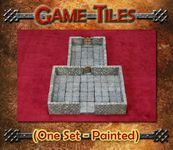 The Game Tiles Base Set is made of "Dwarvenite" and provides all the pieces to make a basic dungeon. There are four styles of tiles: walls, corners, floors, and doors. All the tiles are 2" x 2" yet is compatible with the Master Maze resin line of dungeon tiles. Set comes in both painted and unpainted version.